Decent thriller with a hint of comedy. Due to oversaturation in the horror genre, unique horror movies are very difficult to come by, but this is an exception. The first 15 minutes of this 77 minute film consists of funny yet not side splitting dialogue, and from that point on it is a slow progression into the disturbing. The acting in this film is nothing to turn your nose up at. Going into a movie like 'Pledge' you should not expect absolute brilliance in regards to acting, but you can definitely tell while watching that the actors involved do take pride in their work and they really wanted their performances to be believable. The villains are entertaining & the victims do a good job of portraying the right levels of emotion when being put through all sorts of bodily & psychological torture. The short run time of this movie does nothing but help, as anything longer would have very well run the risk of making the movie too monotonous. 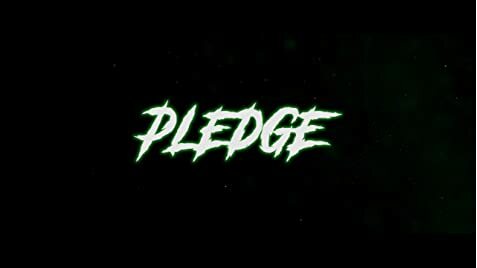 'Pledge' manages to keep your eyes on the screen from start to finish. Another praiseworthy aspect of the film is the beautiful building in which the majority of the movie is shot. Outside & especially inside, the building truly does give off an aura of creepiness about it, which truly does help with the atmosphere. Story wise 'Pledge' is very much lacking, however, I went into the movie essentially thinking it'd be a mix of 2008's 'College' and any of the 'Saw' sequels, and I wasn't too far off. An attempt at a deeper story is made at the end of the film, but it is ultimately unnecessary & the movie could have very well been even better without said attempt. The main criticism I have of the movie is a personal one. I did not feel nearly as squeamish while watching as I was hoping to. This could very well be due to the fact that I have become desensitised, but nevertheless that is a criticism I have. Acting is good, atmosphere is tense, concept is unique, story is lacking but yet somehow not lacking enough & the gore is average. 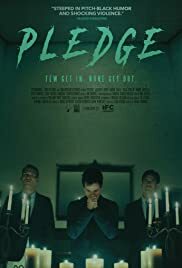 Overall, it isn't likely that 'Pledge' is going to be on anyone's top 10 list of the year, but that doesn't mean it isn't a unique movie watching experience. This film will have its audience, and I include myself amongst that as a big fan (although a very forgiving one) of the horror genre. Definitely watch the movie if you read the synopsis and find yourself intrigued by it.